Evelyn May Jonah, 93, of Fundy Royal Manor, Hillsborough passed away unexpectedly on November 29th, 2018 at the Moncton Hospital. Evelyn was born in Albert Mines on September 16, 1925 the daughter of the late Wilburforce and Daisy (Allen) Smith. She was a housewife and mother whose main priority in life was raising her family with love and support. She was a member of the Hillsborough Baptist Church and sang in the church choir and also with the Silver Chords Choir. Evelyn was very active and loved having fun. She was a member of the Hillsborough Mixed Bowling League for years. Evelyn loved drives through Albert County and going to the camp. She was very fortunate to be able to get around in her senior years and still have her mobility. She passed her love of music down to her children and was happiest listening to her children and their friends play guitar and sing. She was a great mother and grandmother who has left a legacy of not only love but determination. She will live on in the hearts of her family forever. She will be deeply missed by her daughter, Joanne "Joey" Price (Tom) and son, Danny Jonah (Nancy) both of Hillsborough; sons-in-law, Gerard Steeves of Riverside-Albert and Ralph Snelgrove of Riverview ; her cherished grandchildren, Jimmy, Terry, Kelly, Troy, Dawn, Kim, Leanne and Chris and her precious 11 great grandchildren; sister Margaret Pitcher (Lorne) of Carson, AB; brother, Max Smith of Riverview. 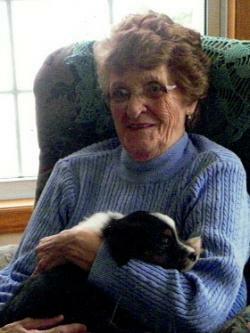 She will also be missed by several nieces and nephews, and by all her family at Fundy Royal. Besides her parents she was predeceased by her husband, Leon; daughters, Audrey Snelgrove and Jackeline "Jackie" Steeves; sisters, Grace Weldon and Doris Fenton; brother, Wilfred Smith. The family will be meeting with relatives and friends for sharing of memories and a time of visitation at the Albert County Funeral Home on Sunday, December 2nd, 2018 from 6:00-8:00pm. A Memorial Service and Celebration of her life will be held at the Albert County Funeral Home on Monday, December 3rd, 2018 at 2:00pm with Rev. Dean MacDonald officiating. Interment will be in the Grey's Island Cemetery, Hillsborough in the spring. Donations to the Bennett & Albert County Health Foundation or charity of the donor's choice would be greatly appreciated by the family. The family would like to say a special thank you to Fundy Royal Manor staff for the excellent care and kindness shown to Evelyn and her family, it will never be forgotten.